… driven from men, and did eat grass as oxen, and his body was wet with the dew of heaven till his hairs were grown like eagles’ feathers and his nails like birds’ claws. drawn. As Robert Hughes pointed out in 1994, ‘Nebuchadnezzar on fire falling over a waterfall clearly related to the acts of self-immolation by protestors against the Vietnam war’. Rob Ditessa', Artist's palette , 'Icons on show', pg. 54-59, Sydney, 2000, 54-55 (colour illus.). Lou Klepac, Australian painters of the twentieth century , 'Sidney Nolan', pg. 136-147, Sydney, 2000, 155 (colour illus.). 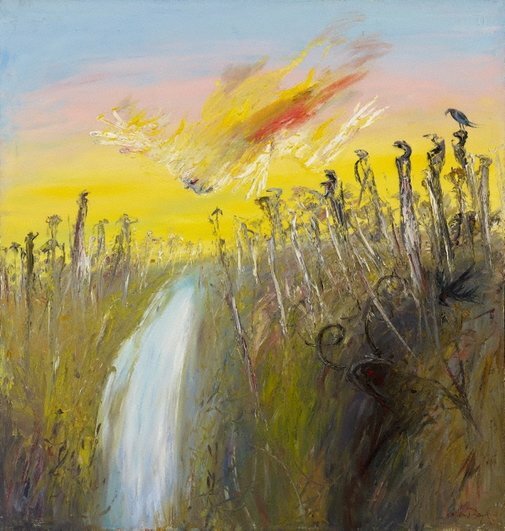 Barry Pearce, Look , 'The legacy in Sydney Arthur Boyd', pg. 18-20, Melbourne, Jul 1999, 19 (colour illus. ), 20. Natalie Wilson, Australian art: in the Art Gallery of New South Wales , 'Out of Melbourne: realisms and mythologies', pg. 163-164, Sydney, 2000, 164, 182 (colour illus., detail), 183 (colour illus. ), 300. When the Sons of Heaven Meet the Daughters of Earth , London, 1997, cover. Collection of 1994 Australian Stamps , 1994, 16 (illus.). The Weekend Australian , Sydney, 01 May 1999-02 May 1999, 23, 24 (colour illus.). Angels of death: exploring the euthanasia underground , Carlton South, 2002, front cover (colour illus., detail), back cover (colour illus.). Arthur Boyd: Art and life , 'Collaborative projects', pg.130-55, London, 2000, 139-140, 141 (colour illus. ), 143. The collection of 1999 Australian stamps , 'Australian legends - Arthur Boyd, AC, OBE', pg. 18-19, Australia, 1999, 18 (colour illus. ), 19.